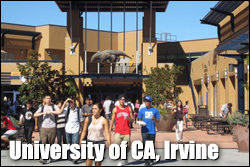 CENIC’s 2015 Annual Conference, Shaking Things Up, will be held from March 9-11, 2015 on the beautiful campus of UC Irvine, where attendees will enjoy three days of programming, demonstrations, sponsor talks, and human networking, as well as presentations by the winners of the 2015 Innovations in Networking Awards. Discounted lodging will be available at the Irvine Marriott Hotel in Irvine, CA. Questions about the program, registration and other general conference information can be directed to cenic2015-info@cenic.org.